Back in 1997, back when System 7.6 was the OS du jour on my PowerBook 1400, a PC-using friend demonstrated to me his new CrossPad, an ingenious device that looked for all the world like a simple clipboard. But built into the backboard was a tracking system that detected the movements of a special Cross pen that contained a small transmitter. The practical upshot was a pad that could record your every pen stroke, and then transfer to your computer an image file containing your doodles, diagrams and writing — transfer it, that is, via a parallel bus, or some such PC nonsense. The CrossPad, for all its brilliance, was a Windows-only experience, and, no matter how wonderful it may have been in theory, there are certain boundaries one simply cannot cross (pun utterly, entirely intended). All this is by way of explaining how excited, and also how oddly nostalgic, I was to receive my new Inkling from the good people at Wacom. 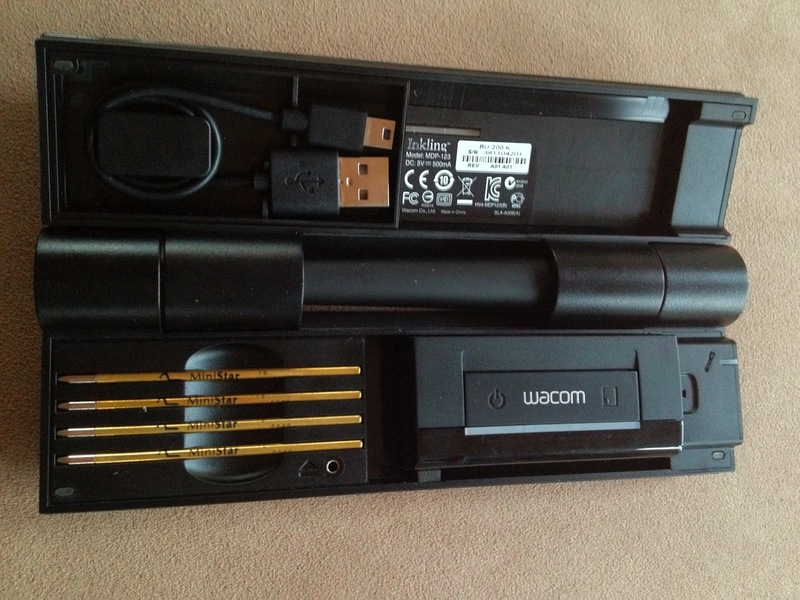 Wacom is known for remarkably oddly named but highly regarded graphics tablets, such as the Cintiq and Intuos and the Bamboo Fun. The Inkling seeks to fill the gap that’s been left gaping since Cross decided back in 2001 that the CrossPad simply wasn’t paying its way. Inkling Sensor and Pen — The Inkling goes a long way toward filling that niche. The part of it that you’ll notice is a sensor box the size of a couple of matchboxes that attaches to the top of a sheet of paper. There, unfortunately, is the first shortcoming of the device. The sensor device has a small clip on its base to attach it to your paper, but the clip opens wide enough (about 3 mm) to accommodate only a couple of dozen sheets — certainly not enough for the bound end of a legal pad. A useful enhancement for future versions would be either a significantly wider-opening clip or some means of anchoring the sensor box to a clipboard. If you’re using a sketchpad with a binding on the side, then you can simply clip the sensor to the top of your page; if your pad is top-bound, then the clip can clip to the side of the sheet, and the image produced can be rotated in software. But this is a product that currently needs to be used on a desk; using it on a clipboard, such as the built-in one that was part of the CrossPad experience, is not really an option. 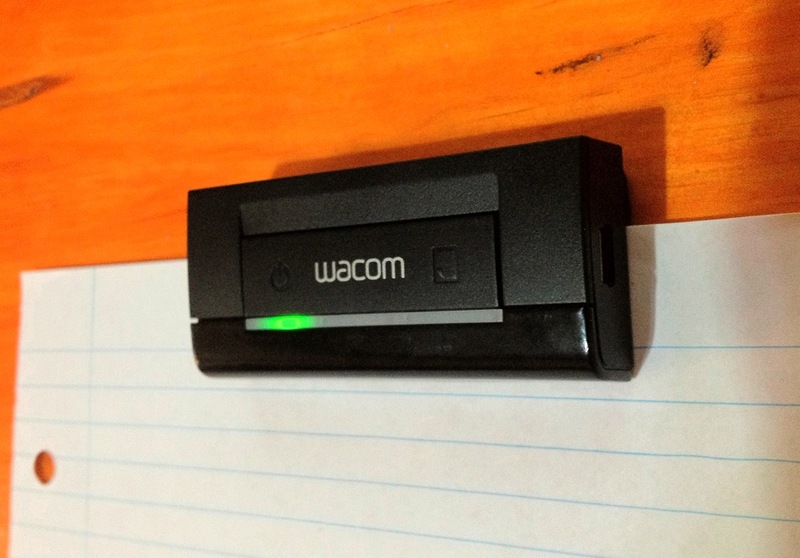 The sensor simply clips to the edge of the paper, which then sits on a desk. If you want to have some form of support or padding underneath your paper, it will need to be either large enough to support the Inkling’s sensor clip or thin enough that the sensor doesn’t hang off the edge and tilt backwards. The Inkling is designed to work with paper sizes up to A4 (similar to US Letter size, for the non-metric world); this provides plenty of usable space, which is good, since the sensor cannot handle input from closer than 2 cm (0.8 inch). Once you’ve clipped the Inkling to your paper, a single button-push activates the sensor, and then it’s just a matter of writing with the Inkling’s special pen. The pen writes like any other ballpoint (in fact, it takes standard mini-ballpoint refills, and even ships with four spare cartridges, a nice detail), but it also contains a small transmitter in the tip. Because of the location of the sensors, you’ll need to make sure your fingertips are a tad up from the very end of the pen’s shaft to ensure a clear line between transmitter and sensor. As you write or draw, the pen detects pressure on its nib, without any perceptible sense that a sensor is being activated, resulting in an entirely natural experience. Once the pen is activated, though, it informs the sensor clipped to the top of the paper that you’re writing, and the whole system goes to work, recording all the movements of your pen. The writing experience is entirely transparent — I found the Inkling quite comfortable to write with. In theory, the pen is supposed to activate with a touch of a button on its top, but my experience has been a little disappointing in this regard; while it’s a touch clunky and low-tech, experience has shown that popping open the battery cap is much more reliable. Using the Inkling — Transferring data to a Mac afterwards is pleasingly easy. 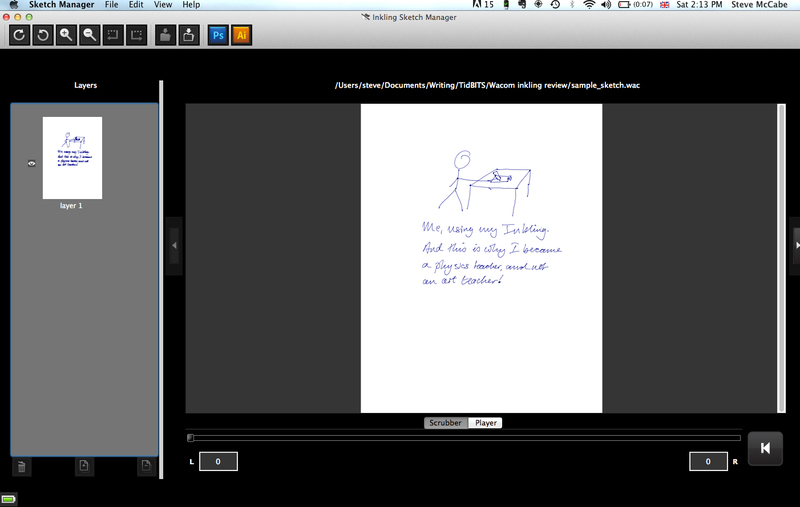 (In case it’s not clear, the Inkling does not need to be attached to your Mac while you’re writing.) The Inkling comes with a 25-cm (10-inch) micro-USB cord, which also charges the device while data is copied to the Inkling’s Sketch Manager software. In Sketch Manager, you’ll find a very good facsimile of whatever is on your paper page — the image the Inkling captures is a faithful reproduction of whatever you’ve drawn. Sketch Manager offers a couple of useful tweaks for your image — the thickness of strokes can be varied, for example. The Inkling’s sensor remembers not only what you drew, but the order in which you drew it, and so Sketch Manager also allows you to scrub through a timeline of your writing and drawing, although I confess to not seeing enormous utility in this feature. More useful is the capability to access an Inkling sketch’s layers; while drawing or writing, a quick press of the “layer” button at the top of the sensor starts a new layer, and these layers can be separated in Sketch Manager and exported separately. The document that is then imported to Sketch Manager is a single file containing multiple layers. If you press the layer button each time you move to a new physical page, each page is stored separately in a single document. Sketch Manager exports to the usual graphics-format suspects, including PNG, JPEG, PDF, SVG, and BMP. Of perhaps more use is the capability to export directly to Illustrator and Photoshop. Sketches sent to Illustrator are converted to vector graphics, with each individual pen stroke a separate vector object, while a Photoshop export results in, well, I don’t know — I never did get a Photoshop export to complete. Sketch Manager claimed to have completed the export; Photoshop acted like it had no idea what Sketch Manager was talking about. Unfortunately, despite the Inkling’s hardware doing a splendid job of capturing my pen strokes accurately, Sketch Manager is clumsy, awkward software. Its interface is non-standard, and a simple task like exporting involves figuring out its obscure button system. Alternatively, you could use the File menu’s oddly named Save as Different Format command, with its unexpected Command-F shortcut. Sketch Manager works, but not in a comfortable or familiar way. 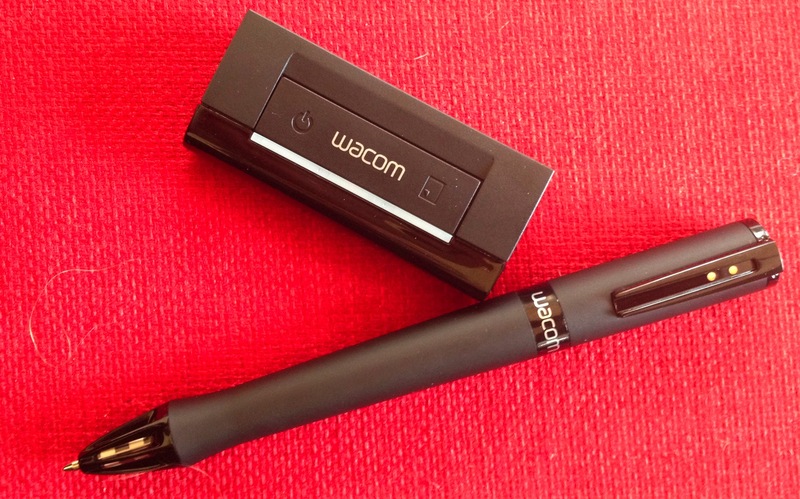 The contrast between the hardware’s ease of use and the clunkiness of the software points up Wacom’s strengths and weaknesses. Their graphics hardware has been market-leading almost since I first started hankering after a CrossPad, and for good reason, but their software leaves plenty to be desired. As a result, the smart move is to get your graphic out of Sketch Manager quickly, either to a relatively static format like JPEG or PDF, or to a manipulable Illustrator file. The vector image exported to Illustrator offers an almost overwhelming degree of detail. View the image at 100-percent zoom and the anchor points are so dense that they appear to blend into each other, giving the illusion of a blue stroke on the lines of the artwork. Zooming in closer makes them easier to work with, but the reality of the image is clear — the Inkling simply detects a series of locations from its pen, and allocates an anchor point to each of them. Larger, wider, more sweeping curves work better; tighter shapes, such as handwriting, tend to result in shapes that are harder to deal with in Illustrator, and are more suited to exporting as raster images. Target Audience? — So who is the Inkling for? The CrossPad was, it seemed, aimed at writers and note-takers, but the Inkling appears to be more focused on artists — not entirely surprising, or unreasonable, given the device’s provenance. With this in mind, and deeply conscious of the fact that I don’t draw for a living, I handed the Inkling off to my far-more-artistic wife. Deborah has recently been working on a logo for a friend, so she was happy to take a look at the Inkling. She printed out a photograph that she wanted to use as the underpinning for the logo, and then drew over it with the Inkling — a step similar to tracing with a graphics tablet. This she was able to bring into Illustrator, at which point she used not the vector image that Sketch Manager provided, but her own drawing that she made with considerably fewer anchors, using the Inkling import as a template; she then whipped the resulting file into shape in Illustrator. The Inkling lacks the invisible always-there-ness of the CrossPad; the tiny jaws of its clip are something of an issue, and I suspect that the build quality of the clip might not be all it could be. It also isn’t a replacement for a graphics tablet. While the Inkling does a bang-up of capturing pen strokes, it does so away from your graphics software of choice. Conversely, a graphics tablet requires that you work tethered to a computer; what the Inkling lacks in real-time feedback, it makes up for in its capability to work away from a computer. What it thus offers is an intriguing possibility for portable sketching and note-taking. The entire kit comes in a compact and well-designed carrying case, about the size of a pencil case, that holds the pen in its hinge, and the sensor clip inside, and the micro-USB cable. As I said, it needs no computer connection while you’re using it; take it to a meeting and you can simply clip it to a sheet of paper and start working, without having to whip out a laptop. Take it home, put everything back in the case, and your data jogs one way down the cable, while power for the batteries in both the sensor and the pen travels the other way. While the Inkling’s appeal to a graphic artist is quite clear, it could also be attractive to students. Handwritten notes could be captured and then exported to an information management application such as DEVONthink where additional metadata could be added later. 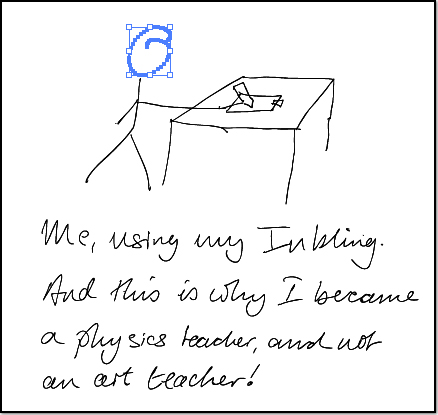 Inkling-based notes would be most useful in lectures that involve anything beyond simple text. Maths or physics students might find the ability to record equations, or graphs, or diagrams quite helpful. While a note or two about Jane Austen could be easily typed on a MacBook, reproducing a three-dimensional vector diagram on a normal laptop’s trackpad would be challenging or even impossible. In the end, then, the Inkling is neither the CrossPad I always wanted, nor a replacement for a graphics tablet. But it is a useful way of transferring freehand artwork or graphical notes to a Mac, and may be attractive to many people who need to record aspects of the world around them graphically. Unfortunately, getting one any time soon may be frustrating. Wacom is apparently selling the Inkling only through Amazon.com, and to judge from comments on the Amazon page for the Inkling, the initial shipment of Inkling units in November 2011 just filled the backorders, and since then, new shipments have disappeared nearly instantly. At the moment, Wacom says “Please check availability on Amazon.com” and Amazon says merely that you can sign up to be notified when the Inkling becomes available. Why not just scan a drawing and, if needed, vectorize it?